This is an excerpt the Rev. 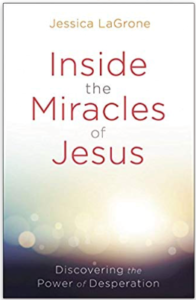 Jessica LaGrone’s latest book, Inside the Miracles of Jesus: Discovering the Power of Desperation(Abingdon Press). LaGrone is the Dean of Chapel at Asbury Theological Seminary in Wilmore, Kentucky, an ordained elder in the United Methodist Church, and a member of the Wesleyan Covenant Association’s Global Council. Her books and Bible studies include Namesake, Broken and Blessed, and Set Apart.